We made this bottle of Almond milk from 5 simple ingredients: Sping water, Almonds (4.6%), Honey (2.6%), Cane sugar and Rice flour. Not only its delicious but its also a source of vitamin E ! 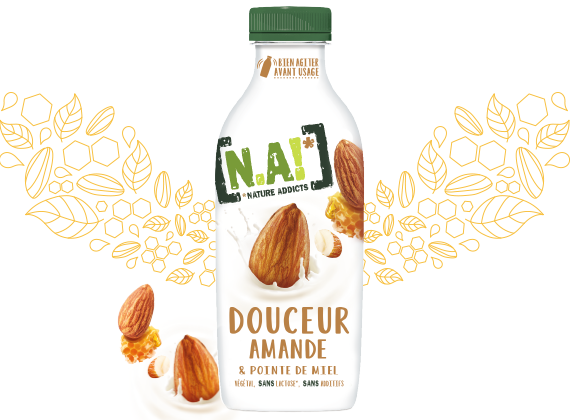 Our Almond Honey Milk is sweetened naturally making it perfect for testing out your baking skills. Our range of fresh products is not available on the online shop. Drink containing almonds slightly grilled with a hint of honey. Store in the refrigirator. The ideal temperature is +6°C. Better to use before: see the bottle cap. Consume within the 3 days after opening.